Tool Blog News Are Vests The New Tool Belts? There are a few different tool vests on the market today that I know of, a couple from Occidental Leather and one from Blaklader, but the vest from Vest-Tech appears to be the most thought out. 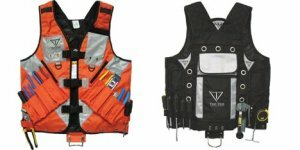 The Vest-Tech goes with a different design versus the other two and has mostly smaller pockets along the chest that can handle your hand tools. At the top is a pocket for your notepad and a protected safety glasses pocket. Moving to the back of the vest along the bottom is a hammer loop, a few screwdriver loops, and a tape measure bracket. Above the hammer loop is a larger pocket, and even a pocket for an included 2-liter water pouch. They thought of everything and added a hole that a fall protection harness ring can pass through. If the vest itself is not enough storage for you, they have additional pockets that can be clipped onto the bottom of the vest. The Vest-Tech is pretty much a one-size-fits-all, but they have built the vest with a number of adjustment straps. The [:cicn:] Vest-Tech can be purchased in Orange or Black for around $130, and the side bags cost between $20 and $30.